Clawhammer (or frailing) is a flexible way of playing the banjo which creates a full sound and a driving rhythm. This style is traditionally associated with traditional American music – but it can be used to play almost anything. It's suited to many roles, from solo / lead melody to rhythmic accompaniment. Clawhammer (also known as frailing) is probably the oldest way of playing the banjo, predating modern bluegrass styles by almost 100 years. Clawhammer was adapted in the 19th century – along with the 5-string banjo itself – from much older African styles of playing. The hallmark of clawhammer playing is a seamless combination of melody and rhythm, so it doesn't matter whether you want to play tunes solo, accompany other instrumentalists or back up a singer or another melody player. Of course, frailing is pefect for playing American folk dance music. But with a little imagination, the style can be adapted to serve all kinds of music, whether it's English polkas, Irish jigs or French bourées. I teach from beginners to intermediate – no prior musical knowledge required. Don't have a banjo yet? I have a spare banjo which I can teach you on in the short term, and I can offer advice on purchasing your own instrument. If you're a new player, I'll give you the groundwork to get you up and clawing steadily. After comprehending the basics, I believe the best way to grasp the style is through learning some catchy and danceable tunes. I can teach you a variety of tunes and show you how to pick up more as you go, all while developing new techniques and deepening your understanding of the banjo. I'm happy to teach by ear, or with TAB & sheet music; if you want to learn music theory then I'll teach you that too, but it's not required! I accompany my lessons with supplementary material in the form of TABs and audio recordings so you don't have to worry about forgetting anything. If you want to learn how to use alternative tunings to explore different sounds and methods of playing, I'll make sure you're comfortable doing that. If you'd rather stick to one tuning and learn your scales all around the fretboard, then that's fine too. Whether your playing a top-of-the-range new banjo or one that's been rescued from an attic, a good setup can do wonders to improve your playing experience. I'm happy to check your instrument and tweak it as required to help you get the best sound and feel out of it. I can also cover some fingerstyle and plectrum techniques for students wishing to add further variation to their technique. For those wanting to improve their clawhammer style banjo playing Theo is a fantastic resource and not only because music teachers in clawhammer are rare gems - they are few and far between, but because of his ability, knowledge and enthusiasm for this genre of music. I have been a student of Theo's for many months and have been impressed by the huge repertoire of tunes he is able to draw from, which includes anything from traditional English/Irish folk tunes to well known American tunes. There is guaranteed to be something to suit all tastes and all levels of playing. Practical teaching is complemented and supported by MP3 recordings of different speeds to practice to. It is also worth pointing out that Theo has a good understanding of banjo set-up and can advise on how to get the best sound out of your instrument. Theo is a great teacher. Always warm, friendly and inspiring. Each lesson he breaks down concepts and techniques into easy to understand chunks. He is happy to tailor lessons to my personal interests, needs and learning style. He creates a supportive and friendly learning environment with great support between lessons via email. Happy to take things at my pace. I have been having lessons from Theo for around eight months and was a total beginner when I started. Theo's friendly and relaxed teaching style has ensured that i have navigated the clawhammer stlye of banjo at my own pace and using the style of tunes that i personally like. He is a very patient teacher and supports the lessons with both tab and audio recordings, which are invaluable when practising at home. 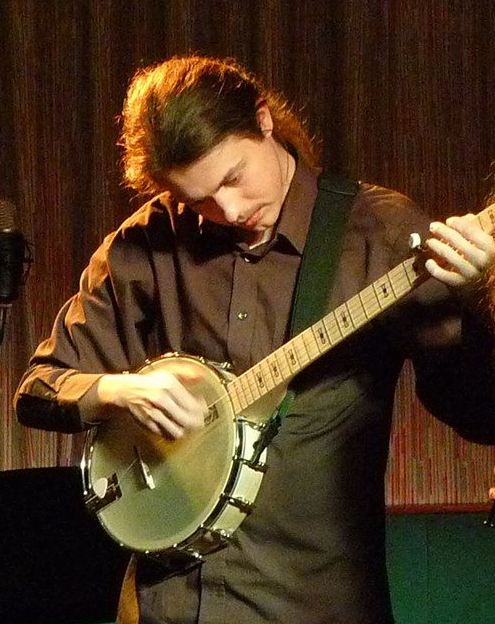 He is very knowledgeable about the workings of the actual instrument as well as just the playing styles and has helped with the set up of the banjo as well as my playing. Theo is a fantastic teacher with a contagious enthusiasm backed up by an extensive understanding of the instrument both physically and melodically. His ability to break down this knowledge and convey it in a manageable way has meant I’ve walked out of each lesson feeling quantifiably better with a banjo! With an extensive and impressive repertoire, Theo tailors each lesson on what style/ direction I want to take and then stages his teaching in a logical and easy-to-follow manner. All in all, Theo is a talented and friendly teacher whom I would highly recommend to anyone looking to learn or develop their clawhammer banjo. For each piece I’ve learned, Theo has provided tablature and recordings of the tune (played at various speeds so I can play along at home as I practice). He even has his own website I use for finding and playing around with chords. Where else would you get this kind of service? 10/10!